The best women’s winter sweaters are those that are warm, good quality, and that will keep you comfortable through the long cold months. The comfiest designs are cashmere, merino wool, alpaca or cotton blends that aren’t itchy and feel great against your skin. There are a lot of options for cozy pullovers, but if you aren’t sure where to start, we have come up with a list of some of our favorites. Whether you are looking for a luxurious gift for someone you love, or are treating yourself, we have found all kinds of designs from long styles that look great with leggings to more fitted cashmere options that are perfect for work; there is something for everyone. The L.L Bean Signature Cotton Fisherman Tunic is an Aran pattern inspired classic, in a flattering longer length. It is known for being soft, warm, and should last for quite a while. 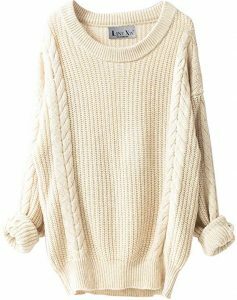 Since it is a cotton pullover, you don’t have to worry about it being itchy, and the knit also contains a bit of cashmere for extra softness. Apart from the softness, a massive plus for this style is that it can be machine washed. Since it is a tunic style it has a little bit of length to it, so you can wear it with skinny jeans or leggings, and it looks great. It does have small zippers on each side at the bottom, that adds an interesting detail that some women like, some not so much. It is thick-weight cotton in a heavy knit so that you can wear it fall, winter, and spring. 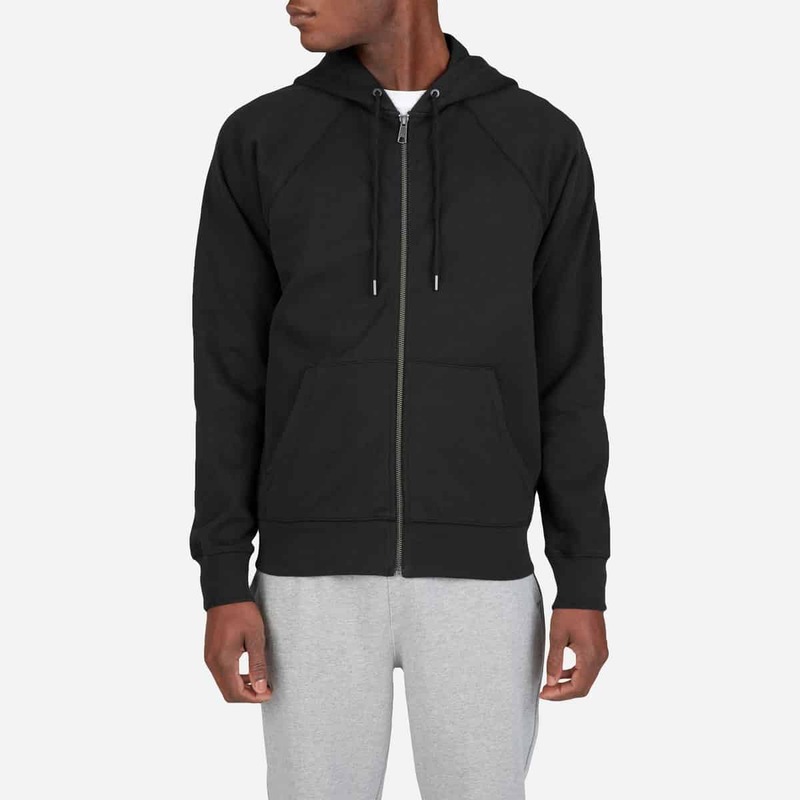 Be aware that the neck hole is slightly wider than a regular crew style. If you like tunics, this is a comfortable, warm, and attractive option. Woolovers is a great place to get good quality knits at very reasonable prices. Their designs are classic, simple styles that come in a wide variety of colors. Their products come from natural fibers that are, for the most part, either wool, cotton or cashmere. A lot of their styles are also machine washable (although check labeling since some is hand wash only). Generally, Woolovers are known for having fantastic quality for the price. Their products are well-made, and the knits are usually pretty warm and comfy. If you are a woman who either doesn’t like or doesn’t have time to shop, but you need nice looking, good quality pieces for the office, you are going to want to check out Mm LaFleur. They are a mostly internet based retailer with a few stores and pop-ups in bigger cities in the U.S. Their business model involves stylists and curated bento boxes of clothes that are a bit beyond the scope of this post to describe. What you need to know is Mm LaFleur is growing like crazy and women who have used this site love the service. They have lovely knitwear that looks amazing, is comfortable, and also durable. They are a bit pricey, but the clothes are built to be wardrobe staples that you will wear for years. 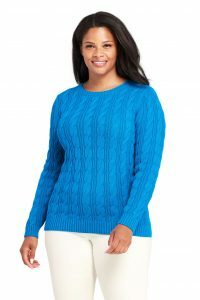 One sweater that caught our eye is the Gemma, it is a horizontal cable stitch made from merino wool, and it has a pretty scalloped edging at the waist and neck hole. Be sure to check out any of the stores or pop-ups if you get one in your city; the consensus seems to be that they are a great experience. 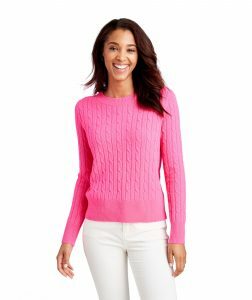 Lands’ End is a fantastic place to get warm, cozy, good quality sweaters. One of their most popular styles is the Lands’ End Women’s Drifter Cotton Crewneck. 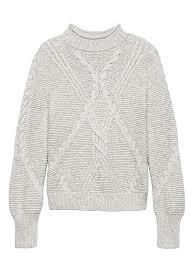 It is a 100% cotton knit that also has the cable design. Since it is cotton, this style can be machine washed, which makes it a great everyday design. The cotton is mid-weight, so it is pretty warm and can be worn as a layering piece in different temperatures. The Drifter comes in a rainbow of really bright, beautiful colors that you can dress up or down. It’s always fun to check out some of the more luxurious options available to see what is out there. 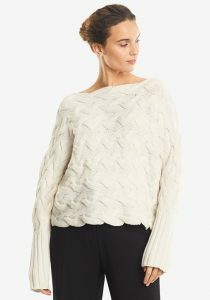 A company that has an excellent reputation for making beautiful, soft sweaters is Equipment, they are expensive, but the quality is reportedly outstanding. The Equipment Asher Cashmere design is a popular option if you love luxury, and are looking for a slightly oversized fit that will work well with skinny jeans or leggings. 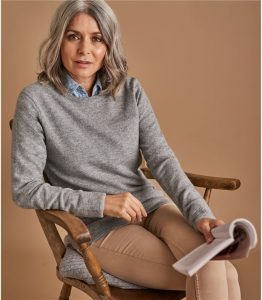 Often cashmere pullovers are more fitted and fall higher on the waist, and it is hard to find styles that have a longline silhouette, so the Asher is a little bit unique for a cashmere style. 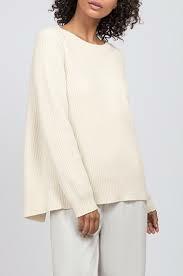 If a $400 cashmere sweater doesn’t quite fit into your budget, maybe try this oversized crew from Liny Xin. It has excellent reviews on Amazon, comes in nice fall and winter colors, and is under $50. It is made from an Inner Mongolia 2-ply cashmere and wool blend, and most reviews say the quality is good, and the cashmere is nice and soft. This style works well with leggings since it is oversized and quite long. It is a medium thickness 5-gauge knit so that it will be warm and cozy. 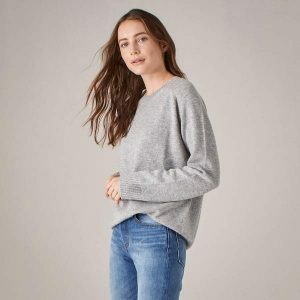 For those looking for an environmentally friendly option that is soft and comfy, you may want to check out The Oversized Alpaca Crew from Everlane. Alpaca is much more sustainable environmentally than cashmere and is super soft and luxurious with kind of a silky feel to it. It also isn’t prickly like natural wool and is hypoallergenic because there is no lanolin in the fabric. 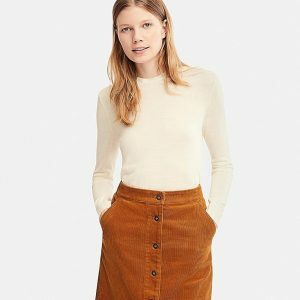 Uniqlo is an excellent place to shop for sweaters, especially if you work in an office and need professional looking clothes that won’t break the bank. They have styles made from ultra-fine merino wool, 100% cashmere, lambswool, cotton knit, and some pretty snazzy coatigans, which are all worth a look. 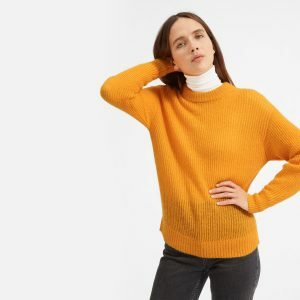 The Uniqlo merino wool styles are great value for simple basic designs that you can dress up or down and look very put together. Most of their styles aren’t itchy, are pretty good quality for the price, and can be machine washed. Uniqlo pullover designs tend fairly fitted, so if like a looser fit you should size up or even check the men’s section. If you love cashmere, Uniqlo carries cashmere options that you can sometimes catch on sale for very low prices. Naadam is a startup that works directly with Mongolian herders to get excellent prices for the cashmere that they use. If you love cashmere, you are going to want to check out the Naadam’s $75 Essential Cashmere Sweater that you can get in crew or v-neck. This design is known for being warm, lightweight, and super soft. It is a unisex fit, so it is a tiny bit oversized, but not sloppy looking at all. This sweater is also reportedly very breathable, light, and built to last. Another luxury pick is this made in Italy design from Cuyana. Cuyana is mostly known for its leather bags, but their clothes are worth checking out as well. The Cuyana Ribbed Open-Back Sweater is a beautiful style that is made from 90% Merino wool with 10% Cashmere that is super soft and cozy. 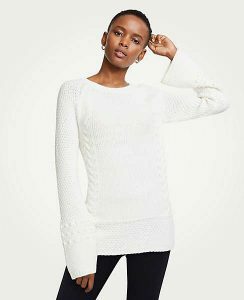 Ann Taylor sweaters are often outstanding quality and usually made from comfortable, soft knits that are perfect for the office or when you need to be a little dressier. Some of the Ann Taylor pieces can be somewhat pricey, but most of their designs are classic shapes that won’t go out of style quickly, and the quality of the fabric means that you can wear them for a long time before they start to show any wear. Ann Taylor styles look great on all shapes and sizes and are wearable by women of all ages who are looking for classy professional clothes. 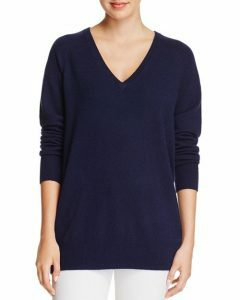 Another brand to check out if you are looking for Luxe cashmere is Vineyard Vines. Their Cashmere Coral Lane Sweater is 100% cashmere and is a classic crew neck style. 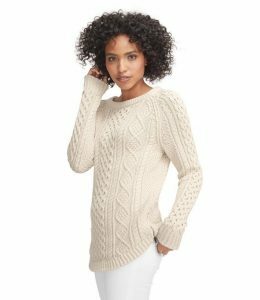 It has a cable knit pattern with ribbed cuffs, hem, and neck. This Vineyard Vines design is made from a soft, cozy fabric, that comes in a lot of gorgeous colors. This list is a little cashmere heavy, but it often makes the most comfortable sweaters, so it’s hard to avoid it. The problem with cashmere is that it is ridiculously expensive. 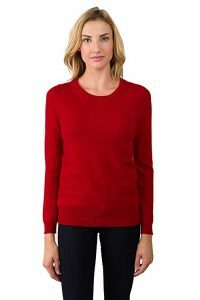 If you want a 100% cashmere that is a little bit more budget friendly, you will want to check out the Jennie Liu Women’s 100% Pure Cashmere Long Sleeve Crew Neck that is a trendy design that sells on Amazon. It is a 12 gauge knit with a 2-ply cashmere. It is reportedly a lightweight yet extremely warm design that holds up well to wear. It may pill a little bit, but if you have a wool comb, the pills come out quickly. It can be hand washed, and most women who purchased this style seem to agree that it is a great value. Banana Republic has too many sweaters to choose just one. They are constantly changing depending on the time year. In the fall and winter, they always have 100% cashmere styles and soft, washable merino wool options that are lovely wardrobe staples. BR sweaters make particularity nice gifts, as the fabrics are usually pretty luxurious and super soft. Cashmere – Cashmere is more fine, yet stronger and smoother than sheep’s wool. It is also about three times warmer than sheep’s wool, so you can stay warm easily without the bulk that you get in a wool pullover. It makes an excellent option for work if you work in an office and you need to stay warm but still look professional. Merino Wool– Merino wool is generally considered the finest and softest wool of any sheep’s wool. Merino is cheaper than cashmere while being almost as smooth. 100% Cotton or Cotton Blend– Cotton can be very soft and comfy against the skin. Some people find it a little heavy in sweater designs and perhaps not as warm as wool or other natural fibers. Alpaca– Alpaca Fibers are usually soft, durable, luxurious with a slightly silky feel to it. It is warmer than sheep’s wool and isn’t scratchy against the skin. Silk – Silk is usually blended with other natural fabrics to make fabrics that are super soft and comfortable against the skin. Avoid acrylics and 100 % wool if your skin becomes irritated easily by scratchy fabrics. Unfortunately, the softest comfiest styles aren’t usually the most durable. More delicate fabrics can pill more easily and are often more at risk for developing holes. Less soft yarns like 100% wool are much more durable, but for a lot of women are uncomfortable and scratchy to wear. You don’t want your fabric to pill, but unfortunately, a lot of styles will pill with wear. If you find this is an issue for you, you can try a cashmere or a wool comb that can be a great tool to help get rid of pills and fuzz. Fabrics like cashmere and silk blends usually have to be dry cleaned. Cotton and merino wool tend to be machine washable. If you don’t like spending a lot of time cleaning your sweaters, you will want to look for styles that specifically say machine washable.